If you remember, my brother's wedding was this weekend. I wrote him a check, of course, but I wanted to give him something extra. I had a personalized engraved wooden box that could hold a bottle, plus glasses made from wine bottles from Refresh Glass. I had asked my brother if he wanted a bottle of something special for his wedding, but he said no. Well that really put a damper on my gift, didn't it? So I went with my other brother's girlfriend to the liquor store and we asked if there was some sort of wine called "Celebration" or one with a bride and groom on it. We were going more for the name and label than how it actually tasted. There was no such thing (that's my million dollar idea now ... just gotta get a vineyard going). We were walking around the store, me with one worker, her with the owner. My brother's girlfriend Chrissy found me with a handful of bottles in each hand. Hear me out, she said. She showed me a bottle of Iron Horse Wedding Cuvee. Perfect. But she had some other bottles in her hand for a secondary gift idea. She grabbed a bottle of Clean Slate and had a brainstorm. What a play on words to drink Clean Slate after a fight. The owner of the store suggested one called X-Rated but that wouldn't exactly work for this couple. Instead, Chrissy found Geyser Peak's Uncensored (so clever that it's a red wine). We walked around the store, trying to find a third bottle and a third occasion. I found Brotherhood's Holiday. In case you didn't know, Brotherhood Winery is the oldest winery in America and it's actually really local to my New York house. It's under an hour from me, which is cool. 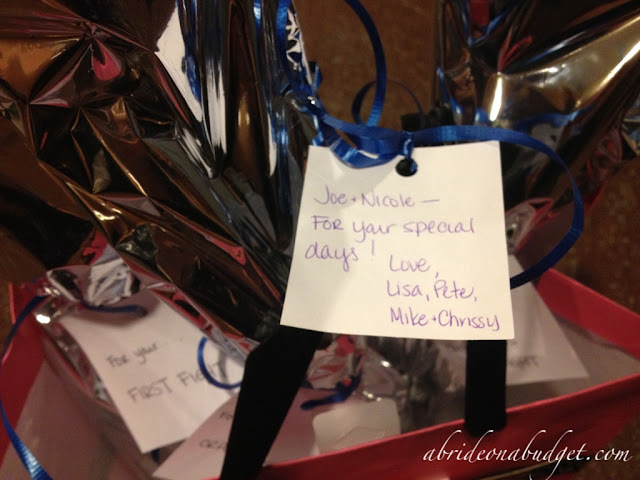 I put them all in a bag that said,, "Enjoy your day" since these wines were all for special days. 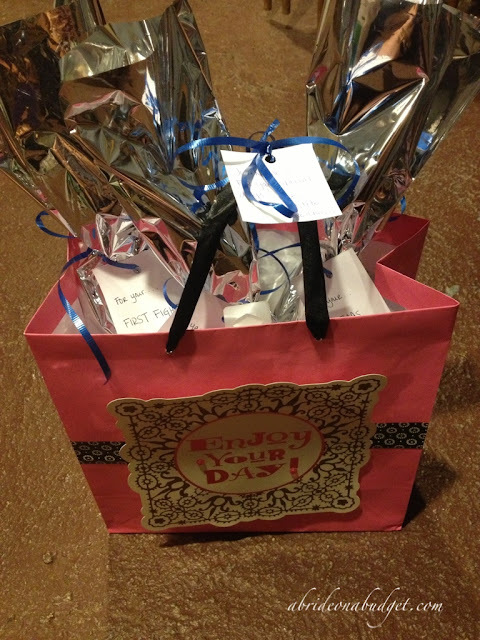 I tied it all together with a tag that said, "For your special days," (since all the tags all said, "For your ... " and the bag said, "day." Really, I took it all into consideration. This was such a cute and "punny" gift. Plus, it doesn't have to cost all that very much if you don't want it to. You're shopping by label, not by taste (so you're not necessarily buying top shelf wine). You can pick up wine for things like: first house, first baby's birth, ten year anniversary, retirement, anything worth celebrating. If you want to step it up a little, you can grab wine glasses (truth be told: the dollar store carries great ones) and add a pair to the gift. This would also make a great bridal shower gift too, but I really liked it for a wedding because there are less gifts there so it won't really get lost. 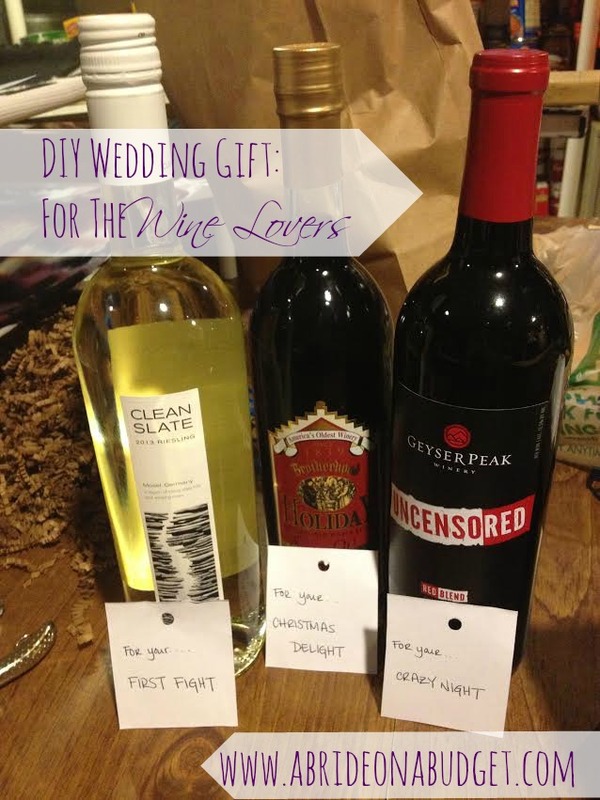 BRIDAL BABBLE: What would you buy a bottle of wine for? This is such a cute idea! And BTW, I'd totally buy a bottle of wine just because I liked the label. What a fantastic idea, I never would have thought of it. It sounds like a plan for an upcoming wedding. Hello stopping over from Share and Show Wednesday! I love this idea! I have a bridal shower coming up and this would be a perfect gift! Thanks for the idea! This is a brilliant idea! I have 4 weddings to attend next year and this will definitely be making an appearance! Great idea...especially...for the first fight. :) Thanks for linking up at Share it Sunday and I am sharing today on FB. Very clever! I would give bottle(s) of wine to an adult for their birthday or if I went to a party at their house. What a great idea! I like getting some bottles of wine and then wrapping it like this. I would so get my in laws a bottle of wine for their wedding anniversary. 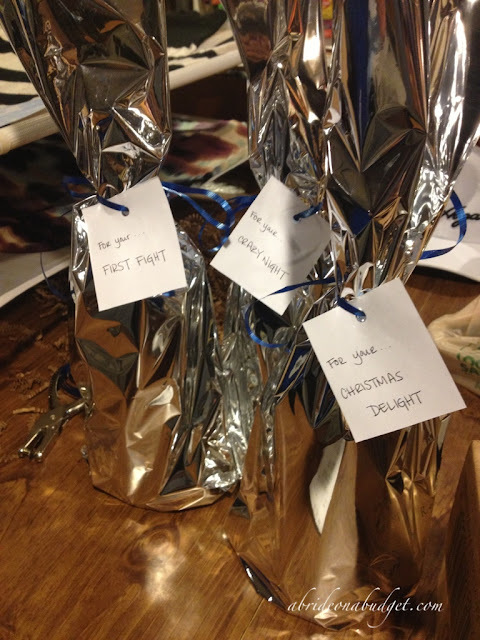 What a great way to carry on the tradition by giving a bottle of wine every year!